The internet is in the process of a change, the last of the webs IP's have been have been delegated to their owners. While you can still get and use a IP address from companies who have a stockpile of these, the worldwide stockpile has been exhausted. IPv4 allows for 4.3 Billion addresses which may seem like a lot, but the fact remains that it is not enough. The newest standard is known as IPv6, which routes 2^128 addresses which is a number that approaches the number of atoms in the Milky Way galaxy (or so I've heard). That means that everything on earth and beyond will be able to have their own static IP address or several billion of them. Ambitious protocol anyone? Obviously this is enough to last potentially forever. There are a few options that can get you using this new standard and let you browse the web in all the glory of IPv6. The option that I will write about is Freenet6 by gogo6. This is a free service to all who desire it, and they are assigning /58's of IPv6 addresses to those who ask. 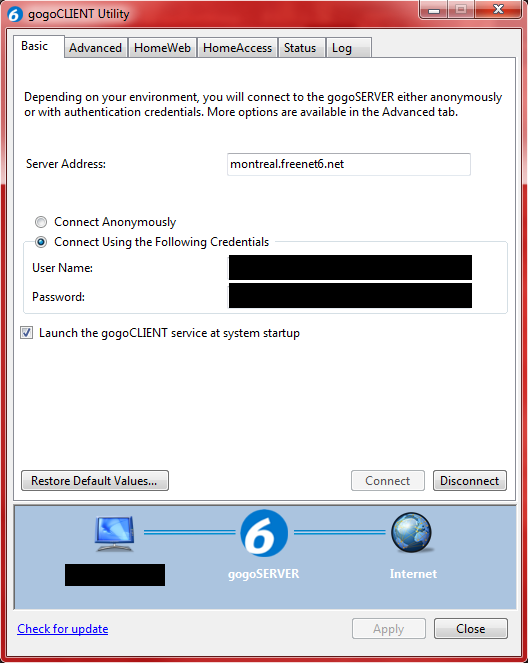 The first steps involved in getting yourself and your computer on the IPv6 web is to sign-up for a gogo6 account. Direct your web browser to www.gogo6.com, and set yourself up with a free login. Once you have your account, proceed to the downloads section. 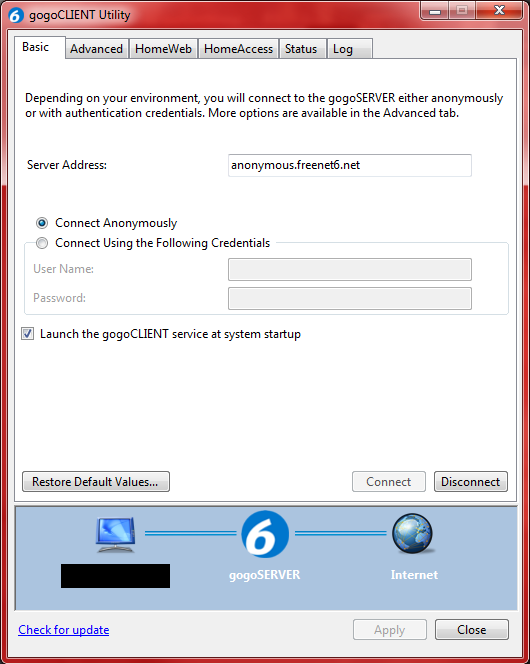 From here you can download the gogoClient which is what will set you up with a IPv6 address. The gogoClient is open source on Linux which is also available from the downloads page. There are two versions of the gogoClient, the one used for most people is the basic version. It offers access to the internet via IPv6 and IPv4 over IPv6 tunneling. The HomeAccess version includes a handy web server that could be used to put a page on the IPv6 Internet. I don't recommend this server for anything but the most basic pages. If you are using Windows 7 Professional you will have access to Internet and Information services which is a far better method. I will go into IIS and IPv6 in another article in the future. If you want a static IP address from the massive pool of IPv6 addresses you will need to sign up for a freenet6 account. For those interested in doing more then just browsing the web, a static IP will be your ticket to doing a lot of different things; the possibilities are endless, programs, websites... giving your refrigerator an IP! Whatever sinks the battleship! Remember that if you sign up for a freenet6 account you get your own /56 or more then 1,180,000,000,000,000,000,000 addresses. Hope you have lots of ideas! Upon firing up the gogoClient you'll be presented with the first screen in the screenshots. If you didn't sign up for a freenet6 account you will want to use the default address: anonymous.freenet6.net and select the connect anonymously option. At this point you will want to proceed to the Status tab to see the progress of your connection. It usually takes 20 seconds or so to get connected. Now you can start browsing the web. Hit up the IPv6 Forum for a list of websites using the new standard. A handy benefit of using the standard settings in the gogo6 client is that you can see IPv4 websites as well as the IPv6 ones. 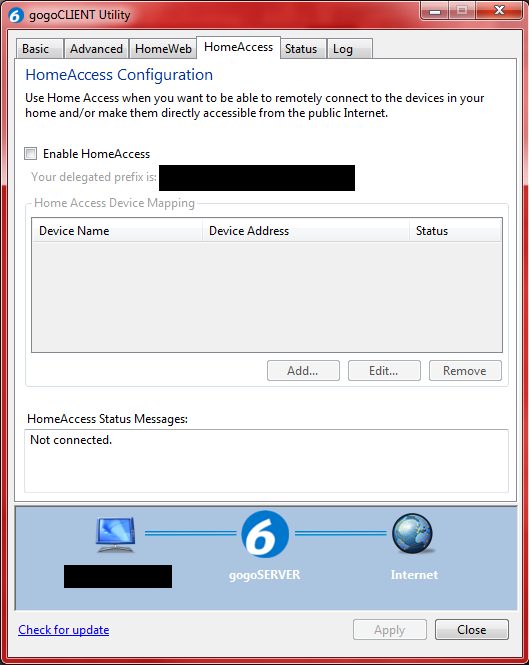 If you downloaded the HomeAccess version of the gogoClient then you can enable your dead simple web server from the HomeWeb tab. Once you have created an HTML file you simply select the folder containing the index.html file you have created. After hitting apply, select disconnect from the basic tab, and then reconnect using your logon credentials. The status section of the HomeWeb tab will point you to your websites location. The HomeAccess tab will allow devices that are attached to your home network to be accessible to the to the internet. A handy feature if your looking to access your files on your home computer from a remote location. Be aware that you will need to configure your router to use HomeAccess, which at the time of this writing is available only by HTTP protocol. Enjoy playing with this new toy, there are so many things that can be done using static IPv6 Addresses, I know I have many ideas and chances are you will see the progress of those ideas here on hobbyware.org.